It's been an eventful year for the networking giant. Here's a look at some of the best developments of 2015. 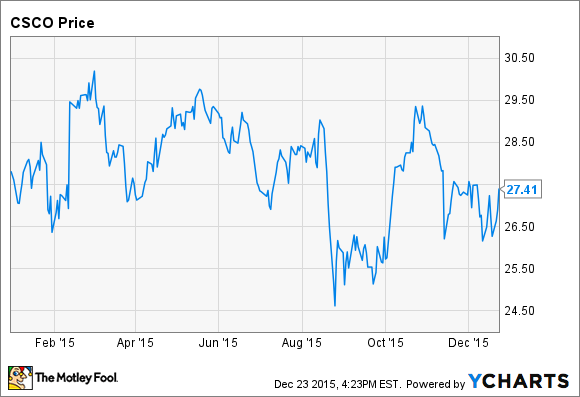 Shares of networking giant Cisco Systems (NASDAQ:CSCO) haven't done much in 2015. The stock is nearly flat year to date, even though the company beat revenue and earnings estimates for four quarters in a row. Cisco's core switching and routing businesses are growing, and some of its smaller segments, such as the data-center segment, are growing at double-digit rates, driving Cisco's slow and steady growth. Despite the stock's inactivity, 2015 has been an eventful year for Cisco. Here are some the best Cisco headlines from this year. Cisco only began paying a dividend in 2011, but the company has rapidly increased that dividend over the past few years. On Feb. 11, Cisco announced a $0.21-per-share quarterly dividend, up from $0.19 per share, a 10.5% increase. Cisco's dividend yield currently sits at about 3.1%, and during fiscal 2015, which ended in July, Cisco paid out about 45% of its earnings in dividends. Thanks to a positive earnings report, shares of Cisco jumped to the highest level in eight years on Feb. 12. Product orders grew by 5% year over year during the fiscal second quarter, an improvement compared with 1% growth in the previous quarter, and Cisco's guidance was in line with analyst expectations. A slew of analyst upgrades followed. One of Cisco's great successes over the past few years is its UCS line of servers. On March 7, IDC released a report on the global server market during the fourth quarter of 2014, showing that Cisco's market share was increasing. Cisco claimed 5.3% of the market, up from 4.5% in the prior-year period, growing server revenue by 19.1% year over year. The latest figures, for the third quarter of 2015, put Cisco's market share at 6.6%. John Chambers became the CEO of Cisco in 1995, after joining the company in 1991. Chambers led the company through the rise of the Internet, the dot-com bubble, and the beginnings of the Internet of Things. Cisco expects 50 billion devices to be connected to the Internet by 2020, producing a staggering amount of data and driving demand for the hardware, software, and services that Cisco provides. On May 8, Cisco announced that Chuck Robbins, who has been with Cisco since 1997, would take over as CEO. Robbins officially took over on July 27. The 2013 NSA spying scandal has done a number on sales in China for many large American technology companies. In May, Chambers wrote a letter to President Obama in response to reports that the NSA was intercepting Cisco hardware, adding modifications that allowed spying on foreign customers, and then shipping the hardware to its final destination. Chambers warned that confidence in the industry would be compromised if these reports were true. On June 17, Cisco announced that it was investing over $10 billion in China over the next few years, forming partnerships with local businesses. Details were scarce, but the announcement removed any doubt that Cisco was serious about overcoming security concerns and returning to growth in China. The iPhone maker hasn't been shy about forming partnerships in an effort to increase penetration into the enterprise. Apple and IBM formed a partnership in 2014, with IBM crafting mobile apps aimed at specific industries. On Aug. 31, Cisco announced a partnership of its own with Apple. The deal will see improved performance of iOS devices connecting via Cisco's networking hardware, and as iOS devices increasingly find their way into the enterprise, the partnership could give Cisco a small but meaningful advantage over rivals. Another partnership, this time with Ericsson, a provider of equipment and services to the telecommunications industry, was announced on Nov. 9, with Cisco suggesting that $1 billion of incremental revenue was possible by 2018. Cisco has been very acquisitive over the past few years, and on Nov. 20, the company announced the $700 million purchase of Acano, a provider of collaboration software. This move comes after a variety of major acquisitions this year, including security firms Lancope, Portcullis, and OpenDNS. Cisco spent $756 million on acquisitions in the 12-month period ending in October, before the Acano deal, and over $10 billion on acquisitions in the past five fiscal years.